Choosing digital SLR, big optical zoom or ultra compact cameras, HD camcorders with great features, compare prices in consumer electronics guide - make a right choice. In comparison with newest entry-level Digital SLR cameras such as the Nikon D60, the Sony A200, the Olympus E420 and old-fashion Canon Rebel Xti, the new Pentax K200D looks quite good. After Pentax K100D / K100 Super, this solidly constructed SLR camera with weather and dust resistant body can impress even advanced photographers, who are interested in serious cameras as the Canon EOS450 / Rebel Xsi or the Sony A300 / A350. Sure, the Pentax K200D is strep of some cool features such as the Live-View mode (Olympus E420, Sony A300) and its ability for using AA batteries is a little questionable. However, the combination of high-speed aperture, in-body stabilization system, waterproof body ( it's a really cool feature, especially for my Sauna-blog), and low-noise high ISO means me much interesting that the Live View LCD, which only enables photographers to hold the camera away from their faces. 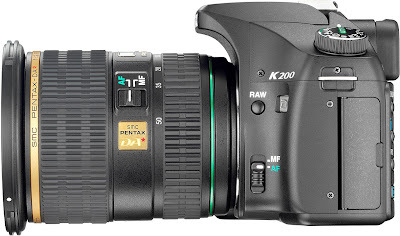 Although the K200D designed mainly for family users and beginners, this SLR has a host of useful features and functions like any higher-class models. As in case of the Sony A200 (for more look at the previous post) and Olympus E510 / E420, main improvements comparing to previous Pentax K100 is in-body optical stabilization system. For more details about Olympus's SLRs look at Olympus SLRs: E330, E400, E410, E500 and E510. Can pop-cams fight vs. Nikon D80 or Canon XTi?. Pentax is using sensor shift stabilization (where the sensor is moving-shifting to compensate the movement of camera body) what means that you do not need an optically stabilized lens and can use any lenses you want. This mechanism shifts the position of the CCD image sensor vertically and horizontally at high speed using magnetic force, while adjusting the shifting speed in proportion to the amount of camera shake detected by a built-in sensor. It offers a compensation effect, equivalent to approximately 2.5 to 4 shutter-speed steps. Sure, the Pentax lens collection is not as big as Nikkor and Canon. 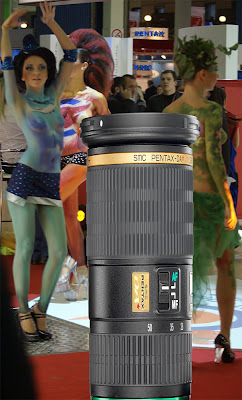 In addition, its quality is an excellent and you can get more than enough from Pentax and do not look at some manufacturers as Sigma and Tamron. The same as the Pentax K10D an excellent weatherproof construction body with some features and great image quality makes the Pentax K200D very attractive for advanced users. However, its weight and dimensions give the best fit for next-level digital SLR cameras. In comparison with the Nikon D60 (522 g), Sony A200 (572 g) and Olympus E420 (440 g), the K200D with its 690 g body is not so good for family shooting. Moreover, for sport shooting where you need a fast frame rate and a long Tele lens, you should consider a speedy camera. 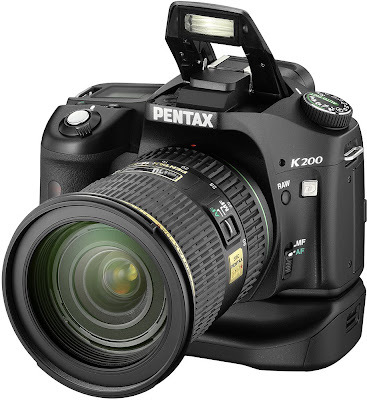 However, for those who need an excellent picture quality the Pentax K200D is a right choice. Looking through the Nikon D60 ($690 with 18-55mm Lens Kit, for any details look through Nikon D60 vs. Canon Xti, Sony A200, Pentax K200 and Olympus E510), Olympus E410 / E510 / E420 ($790 with 14-42mm Lens Kit), Sony A200 ($550 with 18-70mm Lens Kit) / A300 ($950), Canon Rebel Xti ($510) / Xsi ($1130 with 18-55mm Lens Kit), and of course the Pentax K200D it’s hard to find the worst camera as well as the best. All of these SLRs have some pros and some cons. Nevertheless, small 4/3 Olympus with excellent Zuiko lenses, famous Nikon and Canon, rich of features Sony etc. have they own users and admirers. For more look at Canon EOS400/XTi, Nikon D40x and Pentax K10 pros& cons; SLR over SLR-like triple benefits. As for the Pentax K200D, this SLR ($800 with 18-55mm Lens Kit) is good for traveling through dusty or damp climate countries. For those who rate the image, construction and lens quality highly than lightweight, Live View ability and brand name. Hello. 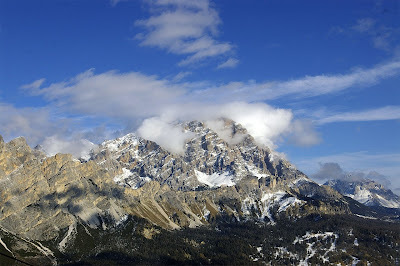 This post is likeable, and your blog is very interesting, congratulations :-). I will add in my blogroll =). If possible gives a last there on my blog, it is about the Smartphone, I hope you enjoy. The address is http://smartphone-brasil.blogspot.com. A hug. I am curious. What do you think of the recently released Fuji S100FS? I see what you mean. Image-wise, why take a 2/3" sensor when you can get an APS-C for less? I'm a travel fan too. Unfortunately, I'm obliged to take two devices: an SLR and a camcorder to my journeys. Maybe it's better (and cheaper) to buy a compact such as a Canon Powershot with a good movie mode as a second camera. But when I do my research on DSLR camera on the net. Most ppl will vote for either Canon or Nikon. Seldom vote for other brands. Your blog is very nice and good to see a different opinion about SLRs when everywhere else you get to hear Nikon or Canon bragging only! I am in the hunt for a good SLR with very image quality and low-light handling. I do'nt want to spend so much on lenses, but i would like to to have a good wide angle lens and a macro lens. Which system would you suggest for this ? Out of this if i want to put together a good system in a cost efficient way, which one would be the better choice. Look at the Pentax K200D. In my opinion, this SLR is the best from these five. Olympus - Wait for the e520 - the 510 colors are off slightly. Sony - If you are taking pics of scenery than it is a great camera. Skin tones are very very pale. Thanks for your reply. 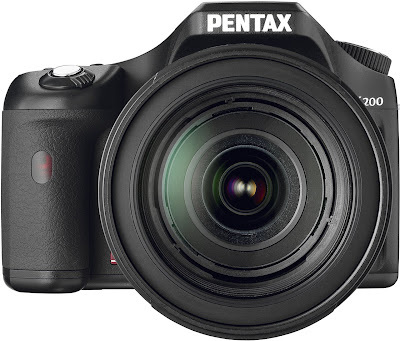 I was thinking about the Sony A700 (instead of my A100), however, the Pentax K20D looks much interesting. As for Nikon and Canon, the Nikon D300 is an excellent, but a little expensive; the Canon 40D...I don't now. Now I'm thinking about Pentax. You have an awesome blog. Not all dry and humorless like the professional sites. I just wanted to say that I bought a K200D yesterday after finding very little to go on, other than your site, and you're spot on with everything. Compared to the beating the K10/100 took in the press, the noise levels on this camera are right up there with my roomie's XTi. Thanks again! Hi Nice Blog .Ipod batteries share the characteristics common to Lithium-based technology found in other devices. Like other rechargeable batteries, these batteries may eventually require replacement.